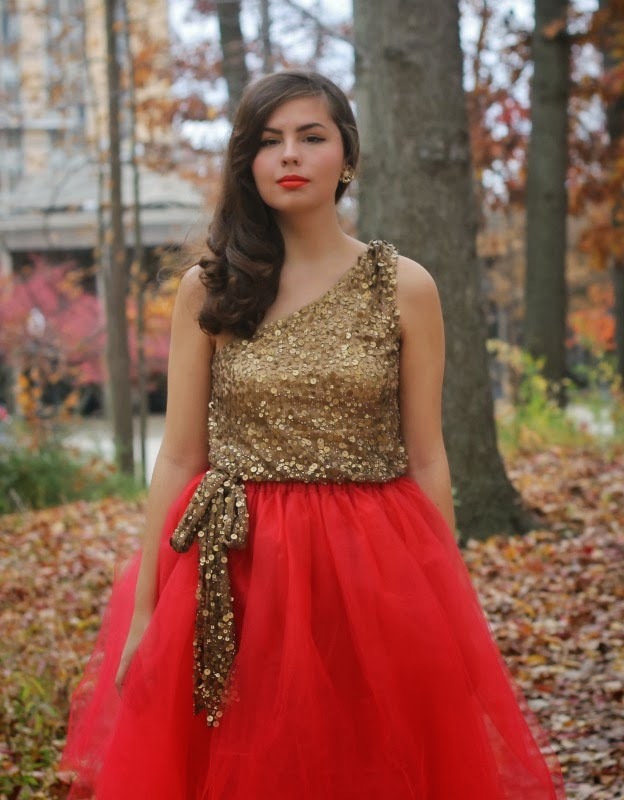 Red Tulle Skirt: c/o Kellie Falconer Designs. Today my swing class held a little fall fling dance! I've really enjoyed learning how to swing dance this semester. At first, I actually hated the class because I am a horrid dancer and, it takes me awhile to catch onto techniques. But as time has gone on I've become more and more relaxed with dancing and come to really enjoy the art of swinging. It was fun to put my skills to the test today for the dance versus the classroom setting. 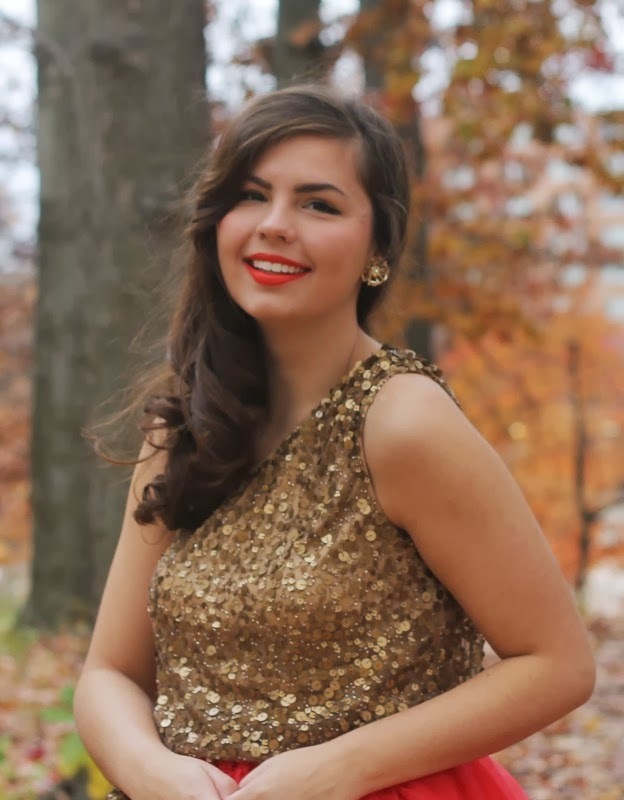 I've had this sequin Faviana dress since August and not worn it because I hadn't a single worthy event! I thought that a swing dance called for this little beauty to make its debut though :) It's incredibly made, completely sequined, and has a silky, comfortable lining. I would definitely recommend checking out Favina if you're looking for your prom dress for the upcoming spring, or even just for holiday dresses! I wanted a full skirt to twirl in for my twists and turns on the dance floor, so I paired the skirt with this custom made tulle skirt from Kellie Falconer. She makes the skirts in any color, so of course I had to pick out a vibrant red; you all know I wouldn't pick any other color, heh. this is officially the cutest dress ever. 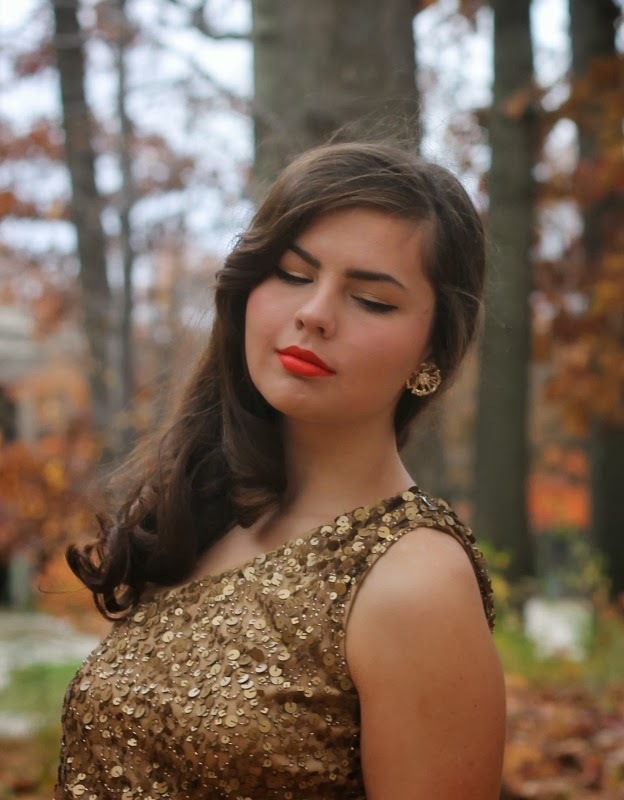 the sequined top and the tulle skirt pair so perfectly, and your retro curls and red lip totally make the outfit. just lovely! Hurrah for swing-dancing!!! Have you learnt Susie Q's yet?!?!?! My favourite step AND the back/tandem charleston!!! Such a pretty outfit! I couldn't wear that dress to swing in though- I just KNOW, I would get caught on some guy's button or something and probably end up garroting myself or ripping it- I seem to be accident prone with any sort of detailed fabric! I accidently got my necklace caught when doing a fast turn once!! Oh and re the 'being terrible at first' thing. My dance teacher said that he taught this guy who was terrible for a long time but he doggedly persevered and now he is actually a swing dance teacher! You look absolutely lovely! That skirt is beautiful! 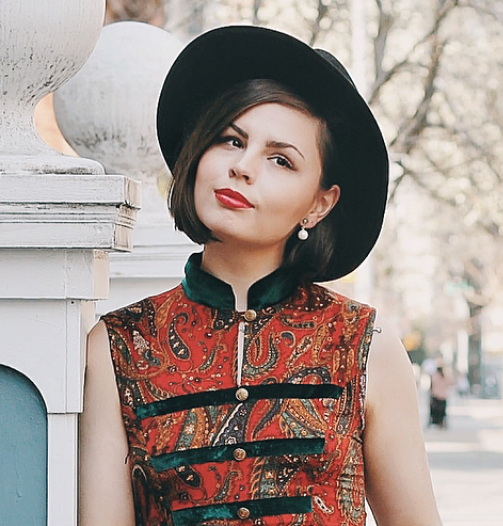 I adore this look, you look so adorable in this outfit! I love seeing you super dressed up! You look gorgeous! And I love everything about this outfit: the earrings, shoes, top, skirt. Sequins and tulle are my obsession. I'm going to be learning swing dancing starting next week and I keep wondering what I will wear. I love the gold and red emsamble! Thats one stunning dress! I wore one of the tulle skirts in plum to our Contra dace, and the way this skirt moves when dancing is just so perfect, isn't it? What a gorgeous, incredibly girly outfit! I absolutely love how much is going on here. 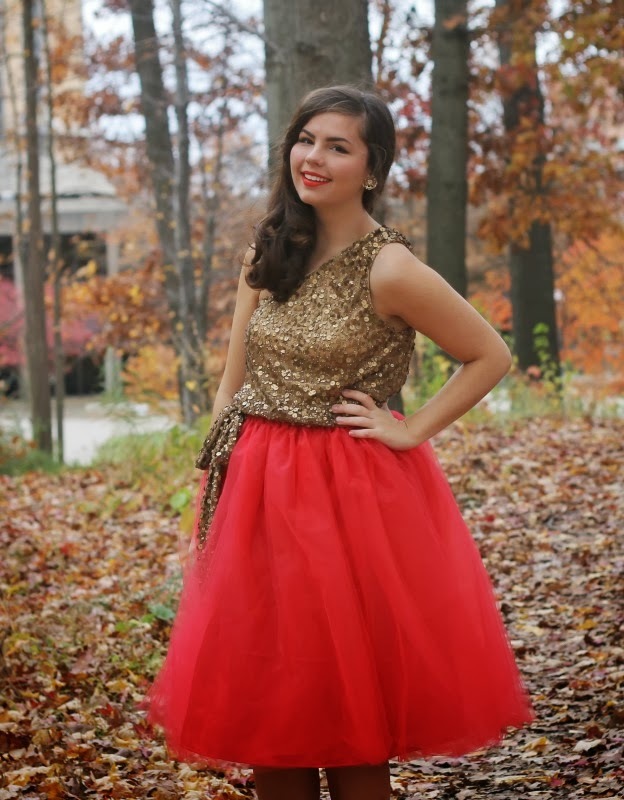 The fluffy tulle and all the sequins! I just love it! Gorgeous! So glad to see you in one of our prom dresses!